Are you and your kids struggling to come up with costume ideas for this year’s Halloween celebration? 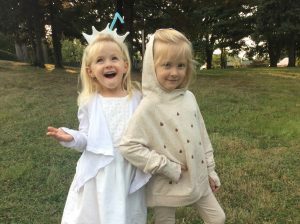 Let the Picniic team help with several inexpensive DIY Halloween costume ideas to try. Moana is a popular Disney movie with many children right now and I’m sure you will see plenty of Moana-themed costumes this year. One of the favorite set of characters from the movie are the Kakamora, a coconut pirate army that chases Moana and Maui on the high seas to obtain the precious heart of Te Fiti. 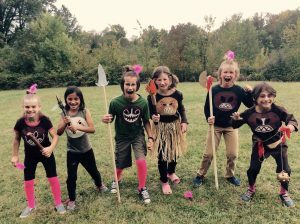 If you have a large family or a group of kids who want to make costumes together, why not create your own Kakamora Army! The kids pictured here supplied their own clothing. We scrounged around for the following items in our own craft stash – you may already have many of these items, too. If not, they can be purchased inexpensively at your local craft store. 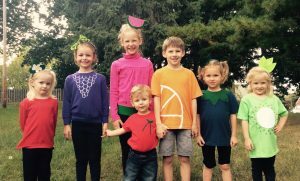 Total Price – $13.18 for all 6 costumes! Using the Internet for pictures from the movie, paint Kakamora faces on brown felt circles and glue to shirt fronts. Paint child’s face to match if you wish. Disassemble dollar store weapons and refashion into new weapons using your imagination and hot glue, twine, dowel rods, red felt cut into feather shapes, and cardboard painted white and cut into shark tooth shapes. Orange and yellow foam can be cut into flames for a torch. A battery-powered tealight can provide a glow. Toothpicks can transform into darts with pink feathers and masking tape. Stick these into clothing, hair, shoes, etc. Embellish with grass skirts, rope belts, etc. Put on your most fearsome face! Be the most current Disney princess – Moana – with this no-sew, DIY Halloween costume option! If you live in a cool climate, for warmth, look in your child’s closet for an underlayer of shirt, leggings, pants, tights, etc. Try to come as close to your child’s skin color as possible. 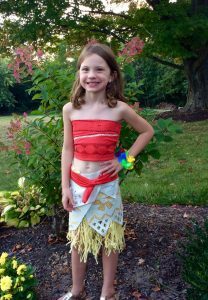 We used these fabulous step-by-step instructions from Sam Skylar to create our Moana costume, using a fabric remnant instead of the tablecloth. 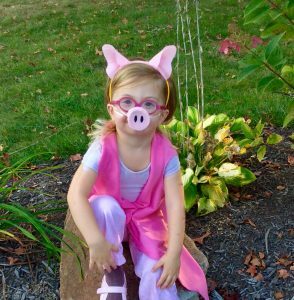 Moana has a pig as one of her sidekicks, so we chose to make this pig costume to represent Pua from the movie. Use a pink or white plain t-shirt as the base. Use matching pants or neutral pants/jeans. We found ours in the child’s closet. For the pig nose, we used this tutorial from Not Just Cute with Amanda Morgan and then we fashioned matching pig ears out of felt, shading the interior of the ear with dark pink acrylic paint for realism. The ears were hot-glued to the plain headband. For the pink fleece vest, we used this tutorial from One Mama’s Daily Drama. The idea for this costume could easily be adapted for any animal of your choice. A group of farm animals or zoo animals would make a great group costume idea, too. What pair is tastier than milk and cookies? Use one of these ideas as a single costume or together for siblings or friends. A perfect choice for these identical twins with different personalities! Use all white clothing for the base of the milk princess costume. Use all tan clothing for the cookie costume. We found ours in the girls’ closets. For the milk princess tiara – cut out a milk splash from white felt, bend and cut a large blue straw to size, hot glue together. You’re done! For the cookie costume, draw chocolate chip shapes randomly over the front of your tan shirt making sure to place cardboard or another suitable shield inside the shirt first – no paint leaking through to the back of the shirt! Allow to dry according to the directions that came with your markers. You’re done! What other drink ideas can you come up with for the milk princess costume? OJ, apple juice, fruit smoothie, chocolate milk…? This was our most involved DIY Halloween costume idea, but turned out oh-so-cute! Use plain, neutral clothing for the base of this costume. Use an ear-flap hat, simple scarf, and goggles for an aviator look. 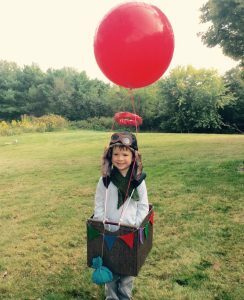 We found these items in this little boy’s closet and fashioned the goggles from brown felt and plastic packaging material, pinning it into place on the hat. Cut out bottom fabric from basket drawer, discard along with cardboard insert. If your drawer has folds, hot glue tongue depressors across the folds perpendicularly to stabilize the basket. Glue on all sides felt bunting and string to decorate. Add one or more “sandbags” made from a 12” circle of scrap fabric, cotton pillow stuffing, and string. Alternatively, an empty sandbag could serve as the treat bag! Have your balloon filled with helium and attach it to your basket in four places using twine. You can increase the authentic look of the costume and reduce fly-away risk by layering colored fishnet over your balloon and securing with twine. Cut away loose parts of the fishnet to eliminate floppiness. Roll red or other colored bubble wrap into an “O” shape securing with clear packing tape and then tape it to your four balloon strings above your child’s head. Now hope that your child doesn’t float away! Another simple group costume idea! Use plain, bright-colored t-shirts for the fruit tops. Use neutral bottoms, dark colors for more fruity pop. We found most of ours in these kids’ closets. Total Price – $17.76 – for 7 costumes! Use a combination of acrylic paint, fabric markers, and felt shapes to transform t-shirts into fruits. Use basic shapes to evoke the fruit rather than trying to be realistic. We discovered that the white acrylic paint showed up really well. The fabric markers were a bit faint for our liking and the felt does not stay on in the wash unless it is stitched down. If we did this again, we would stick with acrylic paints. Also, make sure to put cardboard inside your t-shirts when painting to avoid bleed-through! Create felt shapes or use coordinating ribbon and hot glue fun fruits and leaves to headbands for an additional fruity touch. Try this idea with a group of superhero logos and matching simple capes and eye masks. Or what about evoking various school supplies with your t-shirt design and making coordinating headbands. A whole group of condiments would be fun, too. This was a lot of fun for us to make and a very pretty result! Use neutral or plain, coordinating colored clothing for the base of the costume. Cut out bottom fabric from drawer insert all in one piece, cut this piece of fabric in half, save one half and discard the other half along with cardboard bottom insert. If your drawer has folds, hot glue tongue depressors across the folds perpendicularly to stabilize the drawer. Cut two 56” lengths of wired ribbon. Hot glue each ribbon length to two corners for straps. Wrap ribbon completely around the side of the drawer at each corner to increase stability of costume. 56” lengths will provide enough length for a small teenager. For a younger child, cut your ribbon a few inches smaller or adjust straps using safety pins. Hot glue flowers and leaves across the front inside of the drawer. Use your fabric half from the bottom of the drawer to cover up all those scratchy stems. Lay over stems, glue in place, trim if needed. 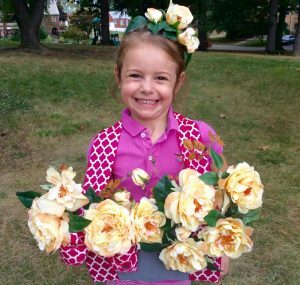 We used the extra ribbon to make a bow for the front and hot glued extra flowers and leaves to a headband for a coordinating headpiece. Use your imagination and alter this idea to create costumes such as a laundry basket, a picnic basket, or a popcorn vendor. Have fun making your costumes this year! And, if you use any of our ideas, share them with us on our Facebook Page – we’d love to see them!